INCLUDE MY MONTHLY HOST CODE! PLACE A PRODUCT ORDER OF $50 or more (total before shipping and tax) in my on-line store using my monthly host code and you can earn tulips toward FREE products from me. Redeem 10 tulips for a $50 shopping spree. Choose the products you want from any current Stampin’ Up! catalogs. Clearance items, Stampin’ Rewards products and promotional offers are excluded. Orders of $150 or more should NOT include the host code and their tulips will automatically qualify. 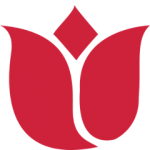 Find this month’s tulip host code here. $50 – $149.99 ORDER (total before shipping and tax): ADD HOST CODE for orders of $50 through $149.99. $150+ ORDER (total before shipping and tax): PLEASE DO NOT ADD THE HOST CODE. Your tulips qualify without the code and you earn Stampin’ Rewards. 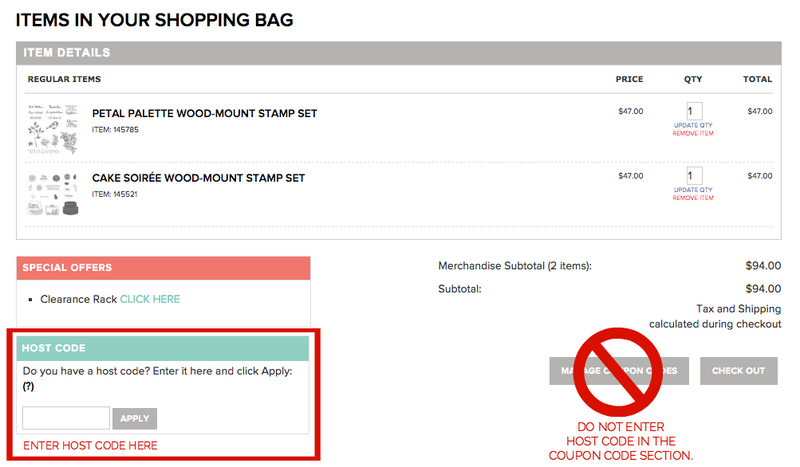 Please be sure you are adding the host code to the host code box and not the coupon code box. Terms and conditions of my Stampin’ Pretty Tulip Rewards are subject to change. Why include the host code? Applying the host code for your qualifying orders ($50 to $149.99) allows me to offset some of the cost of the Tulip Rewards Loyalty Program and offer you a bigger shopping spree, faster delivery and no tulip expiration date! How do I get started earning Tulip Rewards? Add merchandise to a Stampin’ Up! on-line order through me here. If your order is $50 to $149.99 (total before shipping and tax), enter my monthly tulip host code in the host code box. Click apply. Be sure you are adding the host code to the host code box and not the coupon code box (see example below). For every increment of $50 of product purchased (total before shipping and tax), you earn one Stampin’ Pretty Tulip. Example: A product order of $49 would not qualify for a tulip. A product order of $101 would qualify for two tulips ($50 x 2). Separate orders may not be combined to reach a tulip. Qualifying tulip product totals exclude shipping & handling, sales tax and any amounts paid toward items in the Stampin’ (host) Rewards program (including 50% off items). Earn 10 tulips and submit your tulip tracking sheet and choices for your $50 shopping spree by clicking here or email me here. You cannot exceed $50 and pay the difference. Woo hoo! I cover the cost of shipping, handling and tax, too! Discontinued, clearance, Stampin’ Rewards and promotional products are excluded from your spree choices. What if I earned Tulips prior to Oct. 1, 2018? Any unredeemed tulips earned prior to Oct. 1, are valid for one year (from the time they were earned) and will qualify for the new program and benefits whether they used the host code or not.